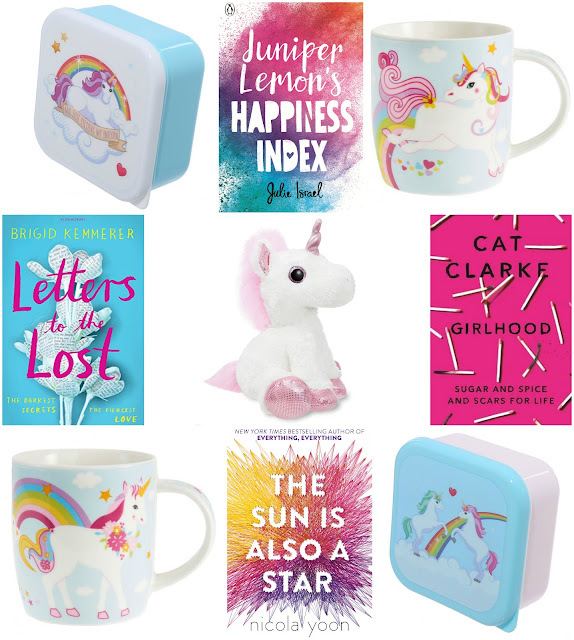 Enter this giveaway for a chance to win four YA books, a unicorn plush and unicorn mugs and lunch boxes. Good luck! Love reading about Fairies. They are magical and so beautiful with their wings. As a child I had my own pretend fairy. Faeries. I love the ones in darker fantasy books that are sneaky and complex. I'm not entirely sure why, I just always loved reading about them. Dragons. I love them whether scary or lovely shifters. And unicorns. They are so enchanting and beautiful. I love reading about witches, because they can be both good and bad and have awesome skills when it comes to spells. "What's your favorite magical creature to read about and why?" Vampires, always vampires! They're the greatest! Vampires for me too. The charming, enigmatic handsome man who seduces beautiful maidens - what a story! I love to read about vampires! Unicorns and Fairies! Unicorns are just so majestic and beautiful and fairies can be written in so many different ways! Dragons because they are so dark and dangerous. I love to read about dragons because they are strong and can fly and breathe fire. Dragons as I find them fascinating and they can be scary or friendly! Geez...it used to be you couldn't really find unicorn books and they are still kind of rare, but I do have my own collection of porcelain unicorns and even a teeny tiny book. I love dragons, mermaids...I have come to love so many fantasy creatures it is very hard to choose just one. Elves and fairies, fascinating stories about them. Most of them are good and help others which I like a lot, there's a bad apple of two but that's the same with anything. I love reading about witches. They are cool! Elves. I love how they can combine beauty with pride and brightness with slyness. Feel, Gancha, and shifters, just to name a few. Witches and dwarfs are a few of my favourites to read about. I love to read about vampires and I have done ever since I first read 'Salem's Lot by Stephen King. I love elves and dragons. Mine is elves because they're cute. I love all fantasy creatures, but Dragon's are probably my favourite. The stories surrounding them are normally interesting, fascinating, and perfect escapism. Faeries are my favorite. Bc They are so interesting, they never lie but always twist the truth, immortal, beautiful and compelling. Wolves. I love how every book follows their history. Probably dragons, they're bit and fierce, yet generally they're written as being quite vulnerable, too. I love all things mythological so it's very hard to pick but it'll have to be vampires, there is so many interpretations of the vampire in many different cultures and historical periods that you can never get bored of reading about them! I really don't have a favourite. It's the story not a creature. Probably faeries because they are magical and enchanting. I have always loved reading about Unicorns, their mythology and just how beautiful they are and how they represent innocence! Vampires!!! I love all the myths about them. They can be the very bad guys or they can be good with very dark shades to them. I find that interesting. How they can be romantic! I think probably dragons because they are so mysterious and scary. Dragons! Suitably magical, mysterious and mythological! I love witches, particularly the Mayfair witches series by Anne Rice. Dragons and elves. They are so beautiful and powerful, each on their own way. Dragons are strong & graceful. I like a good vampire read! I love a good werewolf book (or film) because I like reading about the transformation and also some of the strange places they find themselves in once they change back again. Definitely faeries! They have something dark and magical that makes me love their stories! My favorite is dragons, I'm just fascinated by then. Second favorite is mermaids.